Because this is my grammy's recipe, you have to appreciate the "shakes" and "a little bit of" amounts of ingredients. That's how she cooks and that's how I learned to cook: without exact measurements. Peel and dice the apples and put in a mixing bowl. Immediately put 2 dollops of real mayonnaise (not salad dressing) to coat the apples. This prevents them from browning immediately. Quarter the grapes and dice the celery to add to the mixture. Add marshmallows (about ⅔ of a bag, a little less if you aren't a big marshmallow fan). Last, sprinkle powdered sugar generously over the top. Mix the whipped topping (Cool Whip) into entire mixture. Stir in the nuts (Gram always uses walnuts in this recipe). 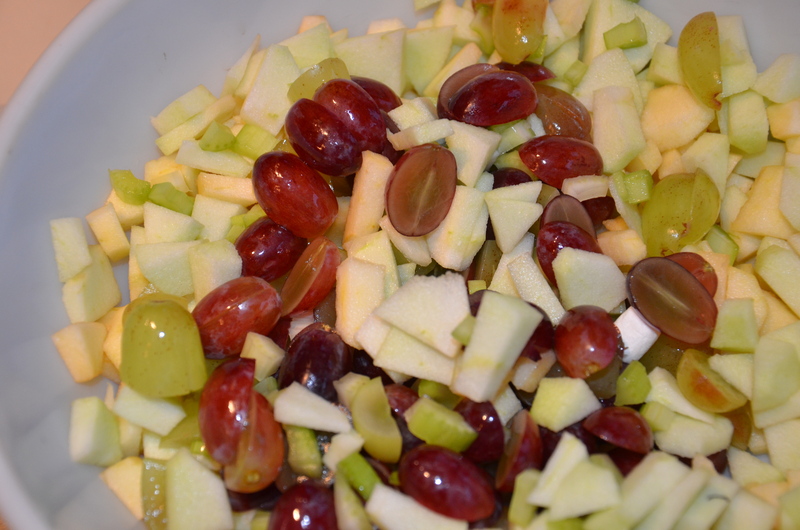 Apple salad is best when mixed about an hour or two before serving. If you want to do a little preparation ahead of time for this dish, cut up the grapes and celery and have it ready to go before the day of your meal.